Motorola Moto G4 Plus has just received the latest update. This update is not Android 7.1 or Android 8.0 Oreo rather it is just a normal security patch update. This latest update has build number NPJS25.93-14-15 and weighs only 42 MB. It only takes less than 10 minutes to install this update. This latest Moto G4 Plus OTA fixes all the Android vulnerabilities up to February 1, 2018. It also fixes the KRACK Wi-Fi vulnerability. This update has already been launched in the USA last month. KRACK is short of Key Re-installation Attack. Basically, this Wi-Fi security vulnerability exploits the WPA2 protocol in all Wi-Fi routers and devices. An attacker can intercept your unencrypted internet traffic and see what you are browsing on the web. However, the attacker cannot see anything if you are connecting to websites which use https. So if an attacker who is in your Wi-Fi router's range gains access then the attacker can inject malicious codes or programs which will surely cause damage to your data and privacy. So, it's better to update your devices and routers. Using the KRACK exploit an attacker can't obtain your Wi-Fi password, and can't attack from miles away or from another city or even country. So always keep a check on your routers and see the number of clients attached. Update the router if firmware updates are available from your manufacturer. 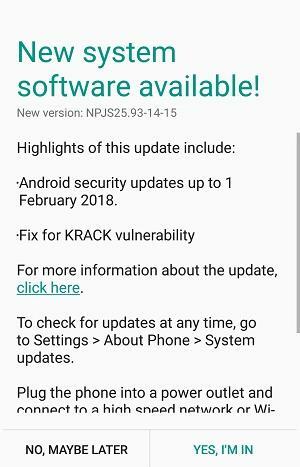 To update your Moto G4 Plus with the latest February 2018 security patch update go to 'Settings>About phone>System updates'. If an update is available then tap 'YES, I'M IN'. Download the OTA and install it. Make sure that your phone is charged to at least 60%. There is one problem with latest OTA update. After installing the update the phone reboots but doesn't boot to the home screen and gets stuck with a black screen. The phone won't start after this update. If this happens then manually restart your Moto G4 Plus by pressing and holding the power button. Release the button when the phone vibrates.